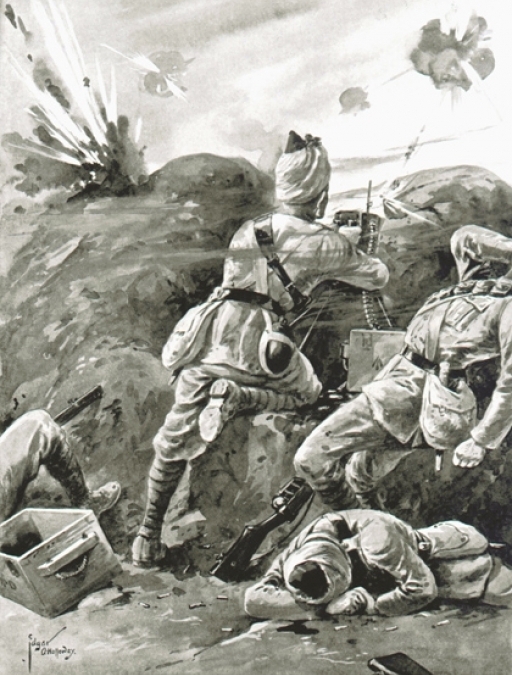 Soldiers of the Lahore Division of Britain’s colonial Indian Army went into action in Belgium for the first time on October 24th 1914. CN writer Christopher J. Harvie discusses a critical moment in the First Battle of Ypres. I am cross posting my piece here. LAHORE: The graduates of the first Gurmukhi Certificate Course were awarded certificates on Wednesday after the completion of the course at the Punjab Institute of Language, Art and Culture (PILAAC). The Gurmukhi Learning Certificate Course – the first course of its kind in Pakistan to teach the Gurmukhi script of Punjabi commenced at the institute last month. Some 35 students were registered for the course, of which 21 qualified the final examination. Gurmukhi is the universal script used for writing Punjabi, and is quite close to the Hindi script. In Pakistan, the Shahmukhi script (also called the Persian script by some) is used for writing Punjabi. The aim of the course was to equip the students with the basic skills of Gurmukhi and making them able to read and write the script. The course instructor was eminent Punjabi scholar Jameel Paul. Speaking at the ceremony, Paul said Gurmukhi was the universal script for writing Punjabi. He said there were around 100,000 Punjabi websites, and only two used the Shahmukhi script for the language. He said by learning this script, the poetry of great Sufi poets like Baba Fareed, Shah Hussain, Waris Shah and Bulleh Shah could be written in Gurmukhi and the people living in Eastern Punjab could learn about this rich Punjabi treasure. PILAAC Director Dr Abbass Najmi said the institute would keep organising such courses in future. Thanks to Isa, I have found this video. A must see for all those who can understand Punjabi and appreciate the nuances of Lahore and its magic. The poem is entitled Tu ki janay bholiyae majay anarkali diyan shanan. This is a humourous poem in an earthy tone using folklore. LAHORE: Indian writer and poet Surjit Singh Lamba, the first non-Muslim to publish an Urdu book, Quran-e- Natiq, arrived in the city on Saturday evening. Lamba, a great admirer of Allama Muhammad Iqbal, published his first book, Nazre Khusro, in 1975. The book contains Amir Khusro’s Persian ghazals translated in Urdu, which is a rare and pioneer work in Urdu literature. He published his second Urdu book, Quran-e-Natiq, in which he highlighted the message of love and unity of mankind – preached and practiced by the Holy Prophet (peace be upon him). Literary circles all over the world have praised the book. MELA Chiraghan (the festival of lamps) will start Saturday (today) at the shrine of Hazrat Shah Hussain (RA), adjacent to the Shalamar Bagh. It is one of grand events in the provincial capital and hundreds of thousands of devotees from all over the country take part in the festivity. Traditionally, devotees light Chiraghs (lamps) at the shrine. Shah Hussain, commonly known as the poet of love, was born in 1538 AD. He was a radical thinker and his poetry and writing spellbind the audience at the shrine illuminated by thousands of lamps and candles. “Mai ne Main Kinon Aakhan,” “Mahi Mahi Kookdi”, “Rabba Meray Hal Da Mehram Toon”, “Mandi Han Kay Changi Han Sahab Teri Bandi Han” and “Mein Vi Jhok Ranjhan Di Jana Nal Meray Koi Challay” are among some of his famous kafees. He was the first Punjabi Sufi poet whose writings were a mixture of five languages i.e. Punjabi, Pothohari, Hindi, Persian and Arabic. His kafees are so simple that one understands his message without any difficulty. “Knowing God by knowing ourselves” is the main theme of his poetry. His work is romantic and has all symbols of rich romantic traditions. Dr Mohan Singh Diwana collected 163 of his kafees and according to his findings, Shah Hussain was a true scholar and intellectual. Some researchers wrote that Guru Nanak was the first poet who wrote kafees in Punjabi language but, the kafees of Shah Hussain, Bullhey Shah, Sachal Sarmast, Khawaja Ghulam Farid and Pir Qutab Ali Shah are gems of Punjabi literature. The present marble-domed memorial of the Sufi, situated at Baghbanpura, near the Shalamar Gardens, does not appear to be old. It is said that after his death in 1599 AD, Shah Hussain was buried at Shahdara, situated on the western bank of the Ravi. But a few years later, the tomb was swept away by a flood. Then, it was shifted to the present site. About 50 years ago, the festival was held on the lawns of the Shalamar Gardens, but the government of Ayub Khan banned it and it was shifted to the shrine of Madhu, a disciple of Lal Hussain. His kafees have been sung by lovers of Sufi poetry for centuries. His poetry will continue to mesmerise the next generations with its message of peace and love. Drummers perform at the shrine and youths and women dance to a deafening beat. Besides the grave of Shah Hussain under the same dome, there is a grave of Madhu Lal, a son of a Hindu Brahmin, with whom the saint was deeply attached. Therefore, a large number of Hindus also come to attend his Urs. Devotees, sitting in and around the shrine, attribute a number of karamat (miracles) to Shah Hussain. One may or may not believe them, but none can deny the literary genius of the saint. Even today, his poetry attracts a great audience. The festival attracts a large number of artistes who sing his kafees and dance to the drums. Locals said the shrine was a focal point for celebrating Basant before partition. Maharaja Ranjit Singh used to celebrate the festival of Basant at the tomb. Once, Maharaja gave robes of honour to all his cabinet members and ordered them to reach the tomb in Basanti dresses. The infantry was ordered to dress in the same colour and stand on both sides of the road from the Fort to the tomb. One of the attractions of the festival is its bazaar. In the past, it was a major point of buying and selling, but presently it has been reduced to the sale of general goods, toys, edibles, garments and bangles. “On the first day of the Mela, processions which come to pay homage to the great saint are worth seeing, especially after dusk. One is possessed by the drumbeat and feels like dancing dhamaal with dervishes,” Muhammad Naeem, a resident of Gujranwala, said. He said he come to Lahore to attend the festival every year. “I came from Nawabshah with my family to participate in the festival,” a half-naked young man, sitting beside a small fire, said. He was wearing chains of big and small stones and putting ash on his body. He said he and his group worshipped fire and they attended the festival every year. Hundreds of people were sitting in the graveyard around the shrine, while a large number of people were also seen sleeping on the graves. Tents were erected in the open place around the shrine where hundreds of people, mostly youths, were openly smoking Charas and drinking Bhang. Some were filling cigarettes with Charas, some were puffing at them and others were preparing Bhang. The festival will continue till Monday. In response to a question by Danish Mustafa I am posting this fabulous article by a leading scholar-poet found here. In the new Lahore lies buried Shah Husain and with him lies buried the myth of Lal Husain. Still, at least once a year we can hear the defused echoes of the myth. As the lights glimmer on the walls of Shalamar, the unsophisticated rhythms of swinging bodies and exulting voices curiously insist on being associated with Husain. This instance apparently defies explanation. But one is aware that an undertone of mockery pervades the air – released feet mocking the ancient sods of Shalamar and released voices mocking its ancient walls. Husain too, the myth tells us, danced a dance of mockery in the ancient streets of Lahore. Grandson of a convert weaver, he embarrassed every one by aspiring to the privilege of learning what he revered guardians of traditional knowledge claimed to teach.